Made for girls by chimps. What ARE these things? And why are they popular? And why are there so many games about their adventures? And why am I playing one? 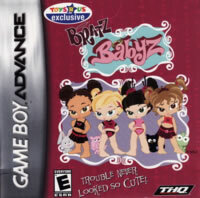 Bratz: Babyz on the Game Boy Advance boggles my mind. I couldn't even begin to explain how mindless this is. Controlling the four babies — great, I actually have to spell it as "babyz" from here on in; do your worst, spell check — it appears we're rescuing animals! At least there's some good that comes from all this. I'd hate to play a game where the goal is to secure a rhinestone diaper. They need to save a blue dog named Snappy from some villainous skeever who goes by the notorious name of "Duane". Never have I been so inspired to topple a criminal as much as I am now. So how will the Babyz rescue pets? Why, with a variety of pointless mini-games, that's how! What, did you expect a full-fledged RPG with a deep, multi-faceted storyline and a unique battle system to maximize the potential of each baby'z personal strengths? Oh, how jaded you must be. Nope, instead, there's a whole world filled with brief Flash games designed to entertain you for seconds before you throw the cartridge in the trash and start taking control of your life again. I hear the DeVry Institute is looking for students. They haven't had one since 1998. The Babyz can participate in a sizable number of activities. Let's get through this as quickly as possible so we can get back to using our brains for something, like curing cancer... or curing ham. Anything! 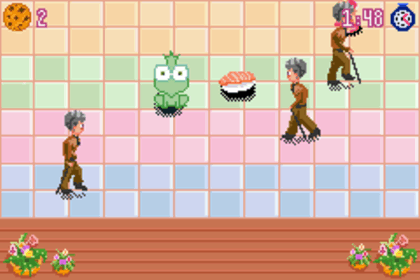 The cursor starts out on "Snack Attack", a Frogger-like mini-game that has you collecting snack treats that fall out of passersby's pockets or baby strollers. Nothing says "sanitary" like snapping up packets of fries, hamburgers, and sashimi off a busy shopping mall floor. Don't mind the hairs and pop tabs stuck to them; those are bonuses! "Fashion Skate" pits you against some kid named Cameron in a virtual skateboarding competition, because that's a perfectly acceptable sport for infants with attitude. Aside from not being able to look away from the chubby thighs, you skate along picking up articles of clothing, not for yourself, but for a random pig in the bottom left corner. I... How does this even help you rescue that dog from the intro? What are you doing? Why doesn't she wear pants? WHY DOESN'T SHE WEAR PANTS?! "Balloonatics" (and I don't understand that name) has you pressing a pre-determined series of buttons quickly to form parts of a balloon animal until you can assemble all the parts. Oh, look, Cloe made a dog! That's great! Meanwhile, your real dog is now Duane's dinner! "Hop And Seek" has you hiding/blending into objects in the background while a baby tries to find you. Problem? The baby spots you, but you can still run and hide without any reprimand. I'm no expert or anything, but if someone finds you, you're found, and you have to sit out, not go hide in a bloody fern. "Karaoke Time" is exactly what you expect... except not quite. Somehow they spliced together karaoke with Dance Dance Revolution, then removed the singing. Instead, this is a DDR knockoff mini-game that uses not only the arrow keys, but also the B-button, the A-button, and the two shoulder buttons, all to make a confusing mess. Also note that all the games use the same stock music sample, freshly churned from the music vat at developer Barking Lizards' headquarters, so it's basically like playing DDR with a MIDI file of "Should've Known Better" by Richard Marx, only the song is far less awesome. And it still has no singing, despite saying KARAOKE in the title. And babyz can't dance. And babyz shouldn't try. If irritating OTHER dogs is your key to happiness, "Wash A Pooch" has you dropping suds and water from above onto passing pooches in an attempt to clean them without anyone's consent. Life has never been so ineffectual. 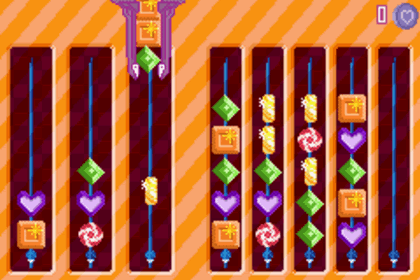 Or maybe you'd prefer to cry in a mini-game that somehow is the least pleasant item dropping puzzle game you've ever experience, knocking Columns down to second place, in "Sweet Necklace Treats", where you try to assemble candy necklaces for no reason whatsoever. You're supposed to try and match what you're doing with what patterns appear on the right, but dropping the wrong piece into a slot makes all of your hard work disappear. Lucky for me, "hard work" was only about seven seconds of labour. No, seriously: WHERE are the parents? The vomitously-titled "ExScream Makeover" (clearly appropriate for its target audience: zombies) has to trying to match your baby'z outfit with one shown to you very briefly. You'll need to pick out its shirt, skirt, hairstyle, and makeup to try and most closely resemble the model you just saw. I don't really want to go into the issue of putting makeup on a toddler... Oh, who am I kidding, of COURSE I want to talk about this. Who in their right mind thought this was appropriate? Are these babyz aware that they're being hypersexualized enough as it is, without having to look like they're about to drop some tunes at the Copacabana? And you just KNOW the ancient adage, "Monkey see, monkey do". Well, whatever monkey made this game should have expected that kids would think it's just dandy to sneak into their parents' room and apply enough concealer to give them the visage of a bologna slice. There's a mini-game called "Top Trumps". I expected this to be about either playing cards or running for president while spouting lies about your opponent's diaper rash, making them unsuitable for government. It's the less exciting option. In "Castle Mazenstein", you race against the other Babyz to get through a maze where anything in front of you is blacked out until you walk into the area. There are boys skulking around, trying to knock you down to prove their Of all the mini-games, I'd declare this one the most competent, but that's like saying which of your toasters is the smartest. You THINK you know which one, but really, they're all smarter than you because you're playing Bratz Babyz and they are not. Meanwhile, "Snappy's Wild Ride", which actually refers to your end goal, literally has Snappy the Dog trying to get as FAR away from the Bratz without being caught for as long as possible. Your goal is to save him, and he'd rather become a mall hobo, living away from the grips of infantile civilization, devouring leftovers from the Greg's Gyro Hut kiosk to survive. It's counteractive to the game's plot, but it does make sense. Would you want to be caught by anyone who spells their own clique name with a "z" like that? "Ring For Blingz" is... No, you know what? I can't do it. Not with a name like that. I'm done. That's it. The game's motto is "Trouble Never Looked So Cute". Koalas look cute, too, until you fiddle with their eucalyptus, and they claw your eyes out so viciously, there wouldn't be a socket left to replace the eyeball.